The bagua is simply a “map” that is laid over a floor plan. 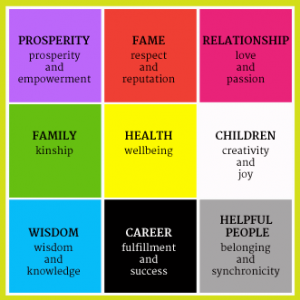 Each section (see bagua below) represents an area of your life. Match up the side of the bagua that contains the career area with the side of your home, office or room where the primary door is. If there are several doorways into a room, office, or home, line up your bagua with the most frequently used door. Now select your spray based on what you desire to achieve or the challenge you are working with in the moment. Spray these supportive and uplifting mists around your body, your space, your car, or wherever you choose. As your needs change, select a different spray!